Sources of vitamin B12 in food not only make balancing your diet just that much easier but also make it possible to eat less getting the nutrition you need. Sources of vitamin B12 such as that in shellfish, seaweed, and squid help your get the vitamin B12 your need in your diet eating less. With B12 rich foods you don't have to worry so much about not having the appetite to eat until you get max out in nutrition in your balanced diet. Most people are not exactly sure what vitamin B12 is good for. In addition to being one vitamin essential for maintaining health, a shortage of vitamin B12 could be damaging to your health. That is why it is especially important to seek out sources of vitamin B12 for nutritional nourishment you take with you in fitness, health, and in your diet till you lose weight and beyond. Vitamin B12 Foods such clams, sardines, and squid rich in vitamin B12 may be what it takes to keep your diet afloat eating less while still getting the nutrition you need for a balanced diet. With a list of food sources of vitamin B12 that seems endless you have just what you need to be on your way. In this diet Slism, we introduce a list of food that contain vitamin B12 so that you can get the nutrition you need in your diet to stay healthy balancing your diet eating smaller meals packed full with thee nutrition you need. Vitamin B12 is a water soluble vitamin that is used as a coenzyme help to support your metabolism. It is used alongside folic acid and vitamin B6 in the formation of blood and is said to lower the risk of clogged arteries. It is good for preventing anemia and maintaining nerve sensitivity. 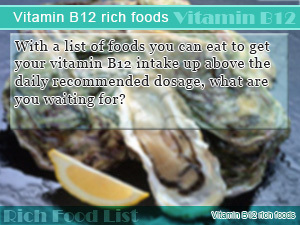 Above all getting sources of vitamin B12 in your diet helps you steer away from lack of vitamin B12. Animal foods sources in general contain rich amounts of vitamin B12. When you need only 2.4μg of vitamin B12 in your diet per day, getting nutrition from the foods you eat not having to rely on supplementation is the best option. Seafood including clams, sardines, and sardines are rich sources of vitamin B12 that make it easy to get you daily dosage of vitamin B12 by simply adding the following foods as a side dish to compliment the healthy meals you will be eating on your diet. Getting more vitamin B12 in your diet doesn't stop with eating clams and seafood. What you will be surprised to find out is that in seaweed such as Nori eaten alongside sushi is packed full with more vitamin B12 than you should ever need. 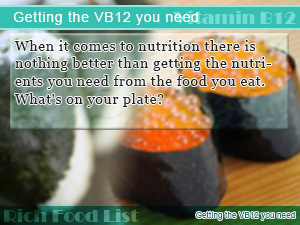 The above table contains foods all over 20μg of vitamin B12. As for vitamin B12 you can get from vegetable sources, there is Aonori Green Laver, Dried Seaweed, and Iwa-Nori. Eating seaweed is said to be an effect way to get vitamin B12 in your diet. Try To Get As Much Vitamin B12 From Natural Sources As You Can! When you get vitamin B12 in your diet from natural sources there should be no reason to worry about the consequences of the lack of vitamin B12. Even though you may not be getting enough vitamin B12 in your diet, failing to notice is not that uncommon. In particular older aged people are at higher risk of suffering from anemia and neurological damage due to not getting enough vitamin B12 in their diet. So far there haven't been any reports of negative effect of overdosing on vitamin B12. Animal food sources of vitamin B12 serve as a quick pick me up if you are ever thing you lack vitamin B12 in your diet. On the other hand, these foods may be accompanied with unwanted fat, which means more calories on your plate. To cut back on calories, eating low calorie shellfish and always looking up calories before you eat. Vitamin B12 is a water soluble vitamin so when being restored from a frozen state take special care while cooking. With a list of foods you can eat to get your vitamin B12 intake up above the daily recommended dosage, what are you waiting for? 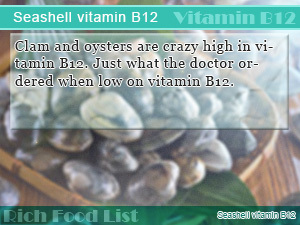 Clam and oysters are crazy high in vitamin B12. Just what the doctor ordered when low on vitamin B12. When it comes to nutrition there is nothing better than getting the nutrients you need from the food you eat. What's on your plate?